HALIFAX, NS – Propeller Brewing helped kick off Nova Scotia Craft Beer Week late last week with the reopening of the newly renovated tasting room at its Gottingen Street brewery, as well as the unveiling of a stylish new look for its branding and packaging. 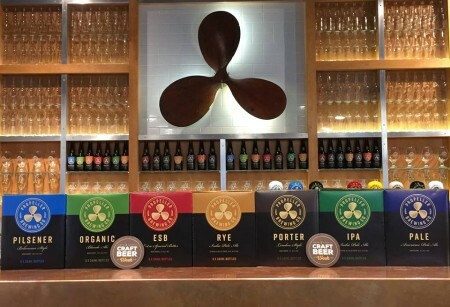 Both the tasting room bar and the new branding have retained the propeller image that has been part of the brewery’s visual identity for 20 years, but the packaging now has a cleaner design that makes it easier to quickly distinguish between the brands while still looking consistent. New look bottles and six-packs of Propeller brands including Organic Blonde Ale, Pilsener, Pale Ale, ESB, Porter, IPA, and Rye IPA are available at both the Halifax and Dartmouth Prop Shop locations, and at NSLC locations throughout Nova Scotia.